Good day, President. As I do not trust your cabinet much farther than being able to advise you as to what food to eat for breakfast, I am personally composing this report. I'm sure it will only cost us a system or two. Our initial efforts were almost ignored. I guess the AI didn't really expect us to be able to get ahold of a command station. They were lucky a few times and we lost some good men, but we quickly gained a footing in half of our local cluster. My scientists informed me we also were recently able to resume production of a "Shield Bearer" ship type; combat reports look a lot less grim after its introduction into our fleet. That is, after we actually obtained it. It apparently took a long time for anyone to realize that the first deployed facility had been outfitted for knowledge hacking and not ship design hacking. I opted not to punish the dunderhead who saw fit to order the wrong research configuration be built, he'll lose enough sleep enough knowing he kept his job despite such a staggering disregard for time spent and life lost. I was also informed of a massive, mostly broken artillery station (I think, I'm also told it can move at a quite respectable pace somehow) that we had managed to obtain plans for from the AI along with the shield bearer. I'm told it was simple enough to load them into our engineering units and bring it online, but that's not really my field. 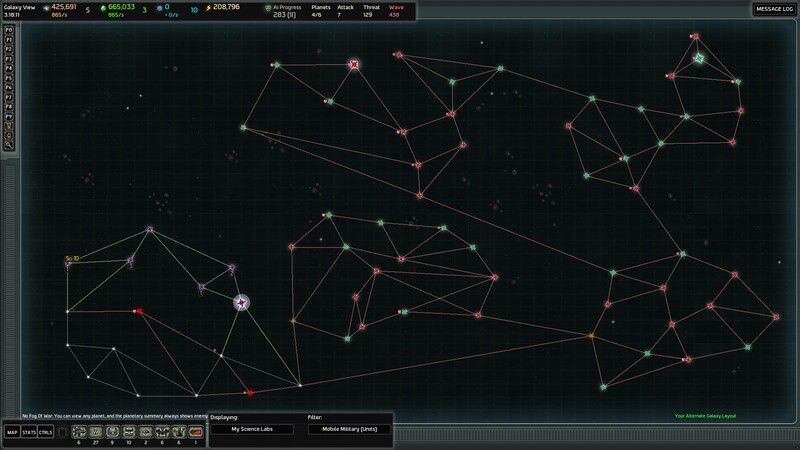 It has been effective in destroying high priority AI targets as a pinpoint strike. The image captures show that it's simply huge, so how it can function as anything other than a brick is beyond me, but I'm happy so far. The AI did seem to notice us bringing it online though, which is slightly concerning. We also located various sources of alien technology, the primary of which being resources used to construct advanced "Spire" ships, and a cache of "Zenith" fleetships. I'm not one for all that anthropology nonsense, so I couldn't tell you what either of those names mean. I do know, however, that fleet performance spiked again once we had a chance to incorporate this technology. We have almost completely sweeped the local space for AI, excluding two entrenched AI positions. I'm still evaluating plans to rout the bulk of their forces safely and will report back again when I have further progress. Thank god for whatever ancient gods or men created these wormholes; I don't think this plan would be feasible without a chokepoint to fortify against assaults. Plans are to solidify control of my cluster, wipe out all of the secondary generator networks, and strike all of the primary network generators quickly. From there, tech up in whatever way seems most sensible, take a beachhead planet roughly equidistant from both AI homeworlds, and kill them off.... somehow.